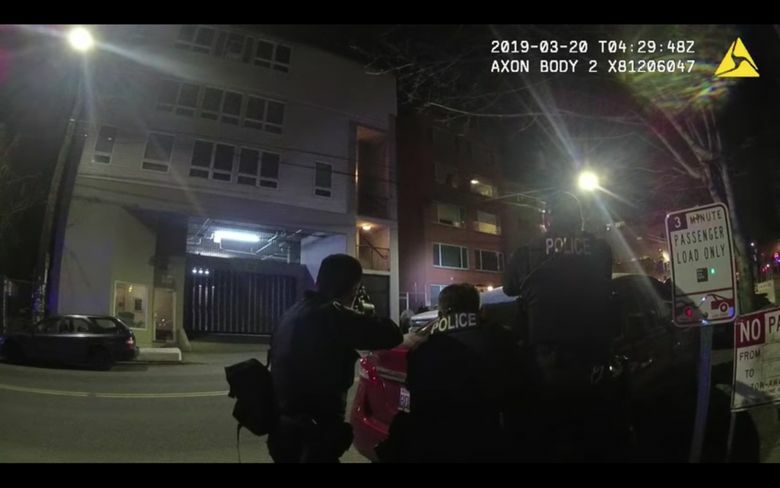 Seattle police released body-camera footage Thursday showing officers’ encounter with a man they say was armed on Capitol Hill earlier this week that ended in officers shooting him. Police responded to a call from a family member of the 37-year-old man at 9:20 p.m. Tuesday, according to a statement from the Seattle Police Department. The caller said the man was armed with a handgun and told a family member he wanted police to shoot him as left his apartment in the 1600 block of Melrose Avenue, according to police. Police allege the man raised his handgun and pointed it at officers, leading officers to fire back, according to the statement. The body-camera footage does not show the man at the moment police say this occurred, and the officer wearing the body camera turned to the side as shots are being fired. The man was taken to Harborview Medical Center with what were described as non-life-threatening injuries. The police department’s updated statement released Thursday does not say whether the man actually fired at the officers, despite the department initially saying that he did on Tuesday both in a statement and at the scene. When asked why the updated statement did not include that, Seattle police spokesman Det. Patrick Michaud said the matter is still under investigation. The incident is being investigated by the King County Sheriff’s Office and the Seattle Police Department’s Force Investigation Team, Office of Police Accountability, Office of the Inspector General and crime-scene investigators. Michaud said that it wasn’t likely the department would release more footage anytime soon, and that the released footage shows a majority of the incident.